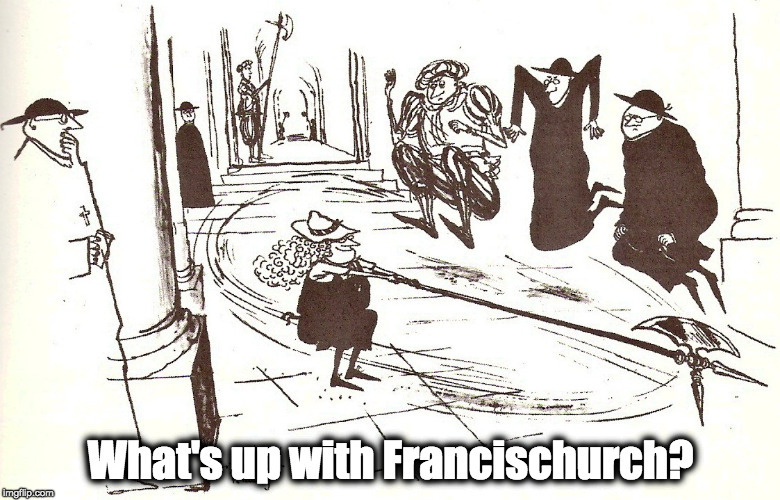 My Big Giant Stick Castle – What's Up With Francis-Church? Last year’s efforts to barely keep ahead of the grape vines. 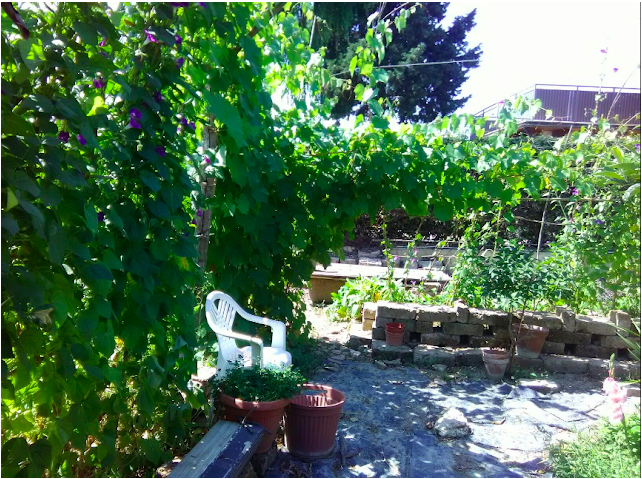 On the right is the wholly inadequate morning glory trellis, and moving left, the arch of grape vines that grew into it, and the small trellis of morning glories and beans that was mostly there to provide shade. I think this was June, so pretty much the height of the growing season. She knows I like to make little wattle things. 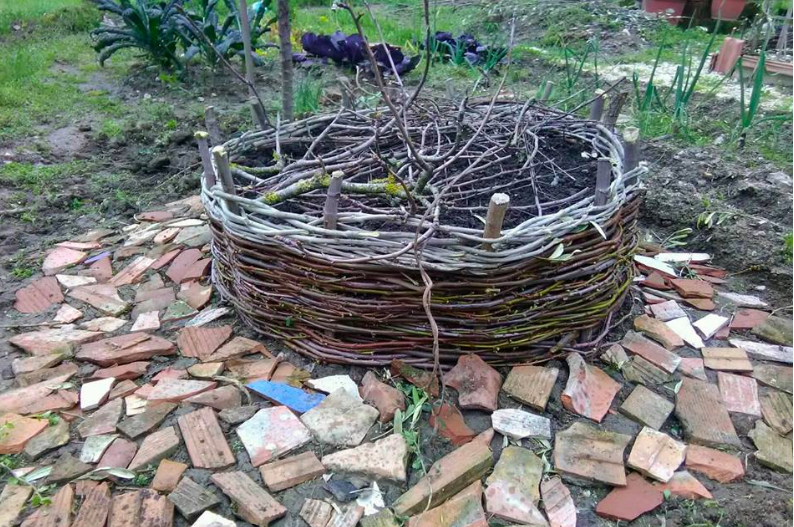 …and make some little movable mini-hurdles to separate some of the more enthusiastic growers, the strawberries, the sage, the lemon balm and thyme, and to subdivide the flower beds and keep things tidy. Then I thought, “Hmmm… some of these bigger bits would make terrific long stakes… I’ll just go get my saw and billhook…” Could always do with a few stakes, right? 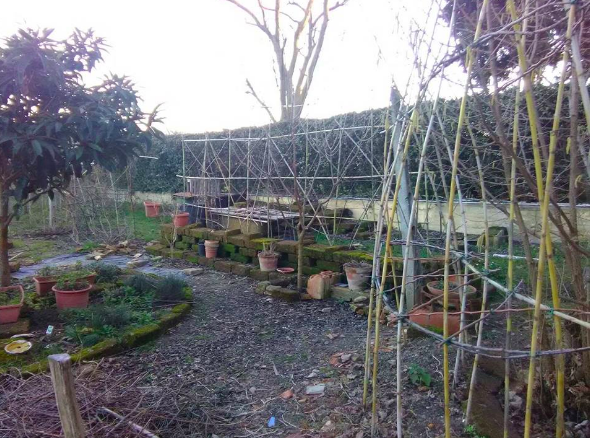 An hour later I was looking down at my big pile of awesome new sticks and I thought, “Hmm…I should just take the dead tomato plants off the tomato trellis, and maybe just tidy it up a bit…” Two hours later I had completely rebuilt the tomato trellis. 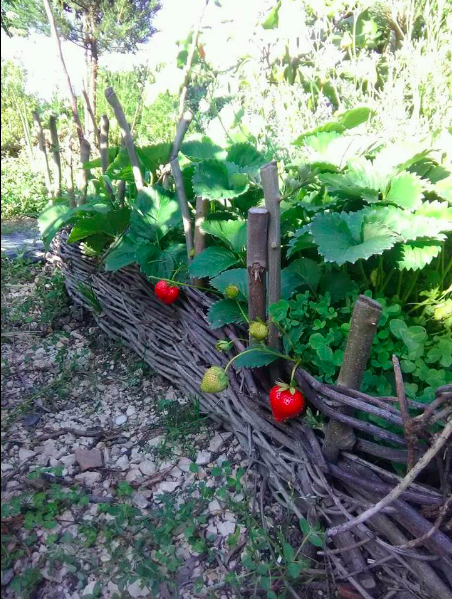 Then I thought, “Hmmm… last year the little trellis for the morning glories really wasn’t adequate…” By the time it was getting dark, it had turned into a major project of stick-architecture, a wall o’sticks, 9 feet high and braced with multiple stick-flying buttresses. Next up is to rebuild the grape trellises. Last year the grape vines grew into this ginormous house of leaves, and I was barely able to keep up with it, building and reinforcing the trellises as it grew… and grew… and… So, this year, I am figuring out how to build a whole proper grape arbour out of sticks and string. See what you can accomplish with a little creative procrastinating? I’ll get some pics tomorrow. Too dark by the time I was done. I did get this good pic of the carpenter bee I got to feed. I’ve read many times that bees, especially bumbles, can get exhausted and even die of exhaustion. So if you see one that just can’t seem to get up and fly, you should try feeding it. 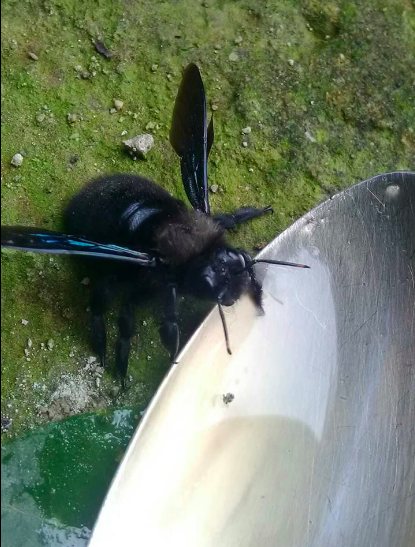 Just get a little honey or sugar dissolved in water on a spoon, and bring it up to the bee’s head. I’ve never had a chance to try this before, but I saw this carpenter bee. They’re not at all aggressive and you can see them working the flowers all summer. But this is the first bee I’ve seen this season. Poor little guy was on his back. When I flipped him over with a leaf, he just sat there not moving, so I thought I’d try the sugar water on a spoon trick. It was fascinating to watch. I brought the edge of the spoon up to just under his head. He waggled his antenae for a few seconds and then put both front feet in the water and lowered his head. A pointed mouth part apparatus was lowered into the water, and then a tiny red filament of a tongue started lapping up the honey water. It was amazing. After a few minutes, I thought I’d leave him alone, so I left the spoon there in case he wanted any more, and went off to do other things. When I came back he was gone. I’ve just realised I left the spoon outside. The big straight one to the left is for climbing flowers, and the curved cage-like one in the right foreground is for cherry tomatoes.